Earlier this week we learned that a fellow judge on Brett Kavanaugh’s bench received a number of misconduct claims against Kavanaugh during his confirmation process, and referred those complaints to Supreme Court Chief Justice John Roberts, who hadn’t taken any action on the matter. But now things have changed in a big way. At the time the complaints first became public knowledge, various legal observers explained that because the review process is a lengthy one, there was nothing that John Roberts could have done with the complaints that would have had any impact on Brett Kavanaugh’s confirmation hearings. But, as it turns out, Roberts didn’t simply decide to sit on his hands. He’s posted a public letter referring the complaints about Kavanaugh to the U.S. Court of Appeals. Although the letter doesn’t mention Kavanaugh by name, multiple major news outlets are confirming that Roberts is referring to Kavanaugh in the letter. So what now? It’s important to keep in mind that John Roberts could have made these complaints go away simply by not referring them, and the odds are that most people would have ended up forgetting about the brief story about the complaints. Instead, by making an official referral, Roberts is opening a de facto misconduct investigation into Brett Kavanaugh, and he’s putting it in the hands of someone who is far removed from the political process that elevated Kavanaugh to begin with. So this is in fact something – even if we don’t yet know quite what it’ll lead to. 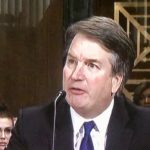 It’s important to keep in mind that if the Democrats take control of the House and/or Senate in the November elections, they’ll immediately launch an investigation into every one of Brett Kavanaugh’s criminal scandals, from sexual assault on down – and they can make a criminal referral against Kavanaugh for lying under oath to Congress. Various legal experts have confirmed that the panel in question can make its findings public if it chooses to. This would hand the Democrats ammunition to use against Kavanaugh as they gear up to try to remove him from the Supreme Court.